I first met Adam Leech in 2007 at his Vintage Clothing Store, The Leechpit. From our first meeting, there was no doubt in my mind that Adam is a genuine-individual. Dressed in the Grunge-punk uniform of tattered jeans, local band tee, and grandfather cardigan (complete with homemade patches and buttons), Leech has become the authority in underground style and culture in Colorado Springs. Born and raised in Colorado Springs, Colorado, Leech jumped from one high school to another, eventually settling into the forefront of charter schools. In an attempt at fulfilling the stereotype of high school punk dropout, Adam routinely skipped class and the few classes he did attend were rarely worthy of his attention. What really interested Adam was music. With aspirations as a punk-rock musician, Adam and a few friends formed The Deadites. The Deadites, later known as The Confessions, entered into the Colorado Underground Music Scene playing a variety of venues all around the Colorado Springs and Denver Area. In 1998, Adam and his girlfriend Heather had their first son. Determined to be the best father he could be, Adam went back to school to study business. While in school, dark times befell The Confessions and in 2001 they disbanded, but Adam continued to be a leader in the Underground Music Scene. 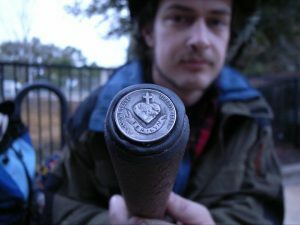 With the help of some college friends, Leech founded the Colorado University Music Supporters and organized concerts to promote local musicians (To read more go to http://www.csindy.com/coloradosprings/locals-only/Content?oid=1118591). After graduation, Adam, refusing to change who he was, found he did not fit into the cubical-suit-and-tie job that society expected him to. Determined to find his own niche, Adam and Heather, opened The Leechpit in 2003. Armed with a collector’s know-how and a stock of vintage clothing, the couple set out to cut away the tedious search that many collectors struggle with. 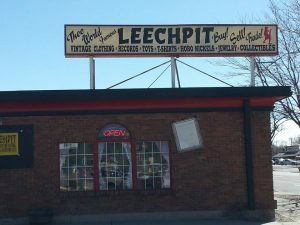 Using a network of friends and enthusiasts, The Leechpit has accumulated a massive inventory making them the go-to place for everyone, from high schoolers to record aficionados. Since the store’s opening in 2003, the Leechs have made “a hop, skip, and a jump” to get where they are now. Relocating twice in the past twelve-years has proven difficult for the Adam and his business, but with the new location he feels more than confident saying, “we’re bigger, we’re cleaner, we’re more visible”. As if starting his own business while raising a family wasn’t enough for Adam, he remains a big part of the Colorado Springs Music and Art community. 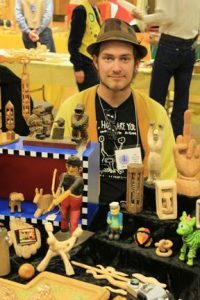 Whether it is writing for the local paper or carving and selling his “hobo nickels”, Adam is always working and constantly shaping the culture in Colorado Springs. 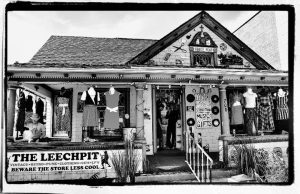 So, if you are passing through Colorado Springs, make sure to stop by The Leechpit for a vintage novelty or some classical threads. Link to the full length podcast of my interview with Adam Leech can be found below.